Some might say that the most important part of Christmas dinner is the turkey (I will obviously disagree!) although when I used to eat meat, we always had turkey as the main. 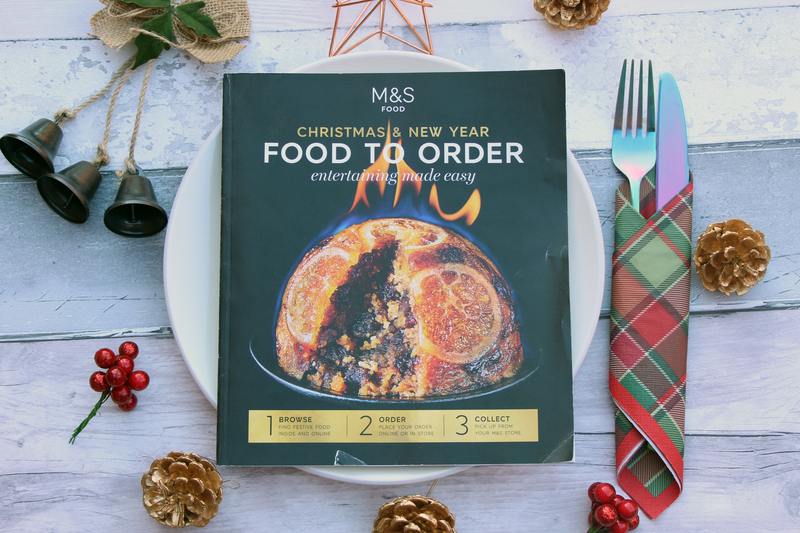 M & S have a variety to choose from but Gareth picked out The Collection British Oakham turkey crown with pork, chestnut, bacon and thyme stuffing. He’s not a big fan of turkey, he’d much rather have a different cut of meat but this turkey is local to us (Oakham is up the road and it’s where his late Pap is from) and we like to shop locally where we can. This varies in price depending on how big you want it but the cheapest is £28.80 and will serve 6-8 people. For a cheaper alternative, there’s also The Collection British beef topside with mustard and herb basting fat. Matured for 28 days to ensure tenderness, this small joint will serve 4 people and will only cost £15. If you fancy trying something different this Christmas, M & S also offer The Collection venison joint with plum and sloe gin stuffing. It might not appeal to everybody but it’s certainly worth trying. From £20, this joint will serve 6 people and it’ll make a welcome change from turkey. When it comes to sides, M & S don’t offer much. This can be good and bad; good because you’ll have to cook fresh and cut down on plastic waste but bad if you’re pressed for time. You can buy a Luxury garnish selection for £10 which includes 6 pork and onion stuffing parcels as well as 12 pigs in blankets. A Christmas dinner just isn’t complete without them. I’m thinking of making a veggie version this year! M & S haven’t done badly when it comes to the vegetarians. Only two out of the five in the book contain mushrooms and there’s only one nut roast. The ones that I like the sound of the most are the Butternut squash and sweet potato rosti which are topped with a delicious onion and feta mix and then drizzled with pesto. You’ll get two in a pack and they’re £7 per box. There’s one other which I’d have been tempted to try and that’s the Parsnip, camembert and chestnut pithivier. I love pastry and this just looks like a warming Christmas pie, perfect for the best roast of the year. This pie is £10 and will serve 4, perfect if you’ve got a few veggies coming for dinner. I was a bit disappointed with the cheese selection in the book. There’s really only two to choose from and they’re both £30! But if you’ve got that money to spend, I’d personally go with The Collection British cheese and chutney selection. You get five types of cheese as well as an apple and fig chutney; all you need to do is supply the crackers! There isn’t any party food in the book which is disappointing, however it does tell you to look in store. It seems like it’s the perfect way to tempt you in and make you spend more than you wanted to! Fill out the form which you can find in the centre of the book and hand it into the Food Information Desk at your nearest store. You’ll need the product number, product name, price, quantity and total as well as all of your personal details. It doesn’t say that you need to pay a deposit which is a bonus! Simply choose your chosen day and time of pick up and it’s all sorted! Browse the full food range on their website and place your order there. You’ll still have to collect in store but if that’s the only time you venture out over the festive period, I’d say that yiu’re doing ok! Come back tomorrow for the last day of my Festive Food Guide when we’ll be going to Aldi, home of Kevin the Carrot!